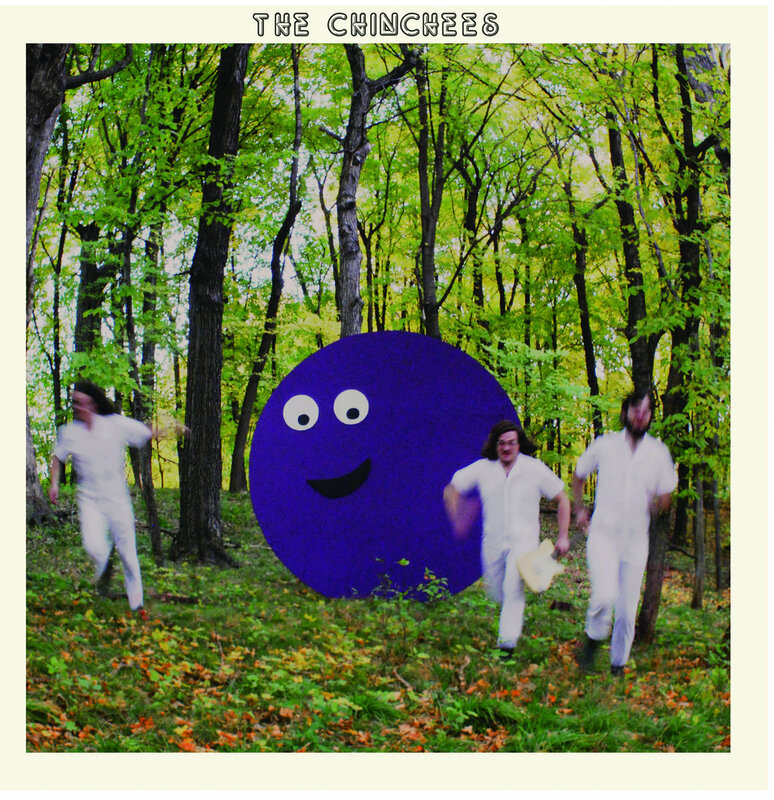 The Chinchees are a garage rock/pop-punk/power-pop band from Minneapolis. They came through Pittsburgh on August 30th, just like Marbled Eye, and just like Marbled Eye, I missed the show, though it seemed cool. Here's a review of their self-titled debut album, so as to get a feel for the band. The cover of The Chinchees is fun and colorful, perhaps a bit oversaturated with fruity sweetness. It displays the band, dressed in a uniform white, fleeing from a smiling giant called "The Almighty Grape". It's a surreal image that fits the musick. I like the white border with the band's name. It helps create a palette of green, purple, and white, with a touch of orange in the fallen leaves. It's a color scheme you might have seen in the 1990's, Goosebumps or Nickelodeon, not unlike what is heard on the album. The album starts full-in with the Weezer-ish (think "Buddy Holly") "Hey Boy". I like the doo-wop vocals and the guitar solos. The bass really pushes this song hard. "Grocery Bag" continues the sugary, singalong quality of the first track, though it's a little darker, soundwise. The lead parts are dissonant and sound like something I would play with their rapid attack; I like it. There's also a really cool part in the middle that I don't know how to explain; the song stops for a second or two and rushes back like rapidly descending a staircase. "You're Gonna Get Stung" is overly snotty, but it's not bad. "Everyone's cooler than me!" the singer wails, "Everyone's cool, they rule!" That's so good! I love that line! It's a little mopey but also funny like the Ramones. There are some more cool leads on this, both in the parts played and the strange sounds. "Spoons" is almost a ballad I guess. It has another good bassline, but I am not a huge fan of this song. It's too long, and it has that Midwest emo-revival sound. "Gosling Day" starts really poppy, more than I like, but it gets much better. There are some cool drums, weird synth sounds, and another mini-stop. "Pocano" is the end of the first side, and it has that ending song feel, the end of a school year as students wearing jean jackets and flannel walk across a campus, the camera panning, and a kiss before the female lead gets on the bus, leaving the male lead to ponder, "what is this new relationship?" What will happen next season? Side two surges in by "Melting Foam" quickly and harder than what we've heard before. Towards the end, the song gets really jangle-y, setting it apart from a straightforward rocker. "GORP" is the shortest song on the album. There are some goofy Beach Boys "Kokomo" vocals that make me chuckle a bit. "Everyone Knows" has a great dissonant guitar solo and a good bassline, but it mostly follows what we've already seen on the album. I wonder how much Minneapolis is like Pittsburgh? "Everyone knows everyone", the singer says. Seems fine. "Animal Genes" is really interesting. The lyrics have cool wordplay, maze-like. The title of "Your Life Is A Waiting Room" reminds me of Fugazi's famous track, but this sounds nothing like that. "They say that I am out of my mind". The tambourine adds a lot to this one, and it sets this apart from the earlier songs. Sometimes I worry that my life is a waiting room. The Chinchees are almost nothing new, at first glance, but that's not true after taking everything in. There's enough to differentiate this from other things here, little bits in each song, that this album is worth a listen. The album gets a little played out by the end, but I enjoyed all the tracks. The production is solid too. I'll look out for The Chinchees next show in Pittsburgh, and you might want to check them out if you like The Ramones, Free Pizza, Polaris, or Shameover. The Chinchees gets a Good.